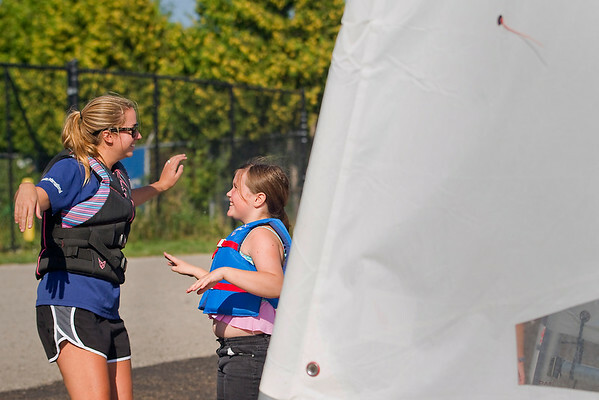 Alecia Neerken, left, of Traverse City and Joie Black, 9, joke around before they and 10 other pairs of Big Brothers and Big Sisters and their Little Brothers and Sisters sailed Lasers from Traverse Area Community Sailing on Boardman Lake on Tuesday, an event organized by Boy Scout Liam Schuler, 17, of Troop 115 in Acme for his Eagle Scout service project. Schuler said he wanted his project to be something that involved the community. "Rather than just doing something like labor, I wanted to something I enjoyed," said Schuler, who spent four years in the TACS summer sailing program. Participants received a lesson from TACS U.S. Sailing Instructors before heading out on the lake.